Anyone that has copied and pasted anything in the past knows how annoying it can be when one wants just the text and not all the formatting and images that come with it. Yes, being able to copy + paste rich text is a handy feature of Windows Clipboard, but it can also be a pain. PureText is a program that allows users to alleviate that pain. PureText is a very small, portable program that strips the formatting and images from copied content. It gives users the option to either just strip the formatting and images from copied content, or to strip the formatting and images from copied content and to also paste the new plain text in the active window. PureText is very simple program. 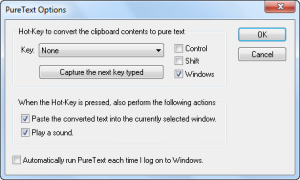 You download it, unzip the download, run PureText (no installation required), and configure how you want PureText to work (which includes assigning hotkeys and picking if you want PureText to paste the content once the hotkeys are pressed). Whenever you want to use convert rich text -> pure text you press the hotkeys you designated and PureText will convert clipboard content to plain text (and paste it, if you selected that). As you can see, aside from picking hotkeys and having PureText paste converted text or not, users can also have PureText play a sound when the hotkeys are pressed and have PureText automatically start on Windows boot. PureText turns rich text into plain text. This involves removing text/font formatting such as size, weight, font type, font color, hyperlinks, etc. and removing images. However, PureText does not modify the text. In other words, it does not remove any spaces, line breaks, or anything of that nature. For my text purification needs, I have been using TenClips . Although I am very happy with TenClips, the one annoying aspect of TenClips is that it converts Windows Clipboard content instead of making a copy of Windows Clipboard content and converting that. In other words, once I use TenClips rich text -> plain text conversion capabilities, Windows Clipboard no longer has the formatted text in it, but rather it has the newly converted plain text; if I press Ctrl + V after using TenClips, plain text will be pasted instead of the original rich text. What I would like TenClips to do is give me the option to leave that formatted text in Windows Clipboard – because sometimes I change my mind about pasting rich or plain text while other times I accidentally use TenClips when I don’t mean to – and instead make a copy of that rich text, store the copy in TenClips, convert that copy from rich text to plain text, and paste that copy. This way I always have the option of normally pasting with Windows Clipboard if I decide I actually want the rich text, or if I only accidentally used TenClips. PureText has the same issue as TenClips. It converts Windows Clipboard content instead of making a copy and converting the copy. I really wish PureText had the option to leave Windows Clipboard content alone. PureText is one of those programs users will potentially have running all the time, so it is important to analyze how much of a footprint it has. As already mentioned, PureText is very small – 28 KB – and portable so there is no worry about it hogging hard drive space. More importantly, however, it uses very little RAM (one to two MB) and negligible amounts of CPU. Don’t worry about PureText slowing your computer down because it won’t. PureText is not feature filled; but it doesn’t need to be. It is a simple program aimed at doing one thing and one thing only: Purifying text. PureText is one of those programs many people will use almost every day. Take this from a guy who has been using a text purifier for a really long time: Once you start, you can’t stop. PureText does not have an official 64-bit version; the 32-bit version may or may not work on 64-bit machines.